Saw frame for goldsmith, model design and labour. 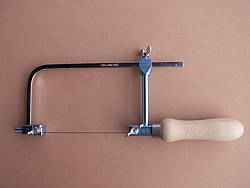 Exclusive Saw frame with special hand-freindly handle. The construction is very stabile and usable for hard work. The surface is hard anodized and through this very long-lasting.